Island’s Edge Luxury Private Pool Villa has panoramic views of Pereybere Beach. The self-catering villas feature private infinity pools and beautifully landscaped tropical gardens. Each lavish villa boasts sea views and has a fully equipped kitchen, lounge and dining area. All bedrooms come equipped with a flat-screen satellite TV, minibar and tea/coffee-making facilities. 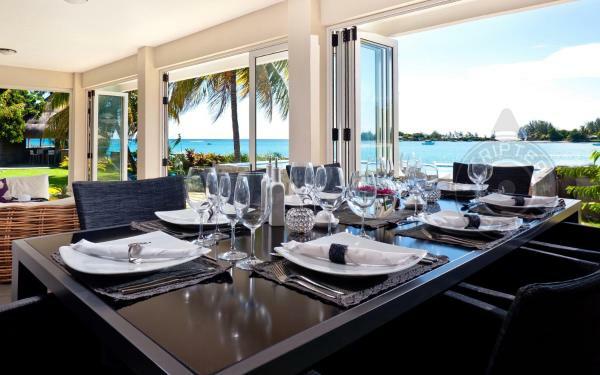 A private chef is available to prepare meals for guests in the comfort of their own villa. Guests may send a list of groceries prior to arrival and the staff at Island’s Edge will do the shopping for them and deliver for an additional fee. The bay is well protected by the reef making it safe for both snorkelling and swimming. Activities in the area include water-skiing, sea kayaking, and undersea walks. Free Wi-Fi and private parking is available. Pereybere’s village centre and public beach is 100 metres away along the seafront, and Grand Baie is 2.5 km from the property. Please note, the chef service is not available on Sundays or public holidays. Guests are required to show a photo identification and credit card upon check-in. Please note that all Special Requests are subject to availability and additional charges may apply. Please inform Island's Edge Luxury Private Pool Villas in advance of your expected arrival time. You can use the Special Requests box when booking, or contact the property directly with the contact details provided in your confirmation. A damage deposit of EUR 1000 is required. The host charges this 30 days before arrival. This will be collected by credit card. You should be reimbursed within 7 days of check-out. Your deposit will be refunded in full via credit card, subject to an inspection of the property. Payment before arrival via bank transfer is required. The property will contact you after you book to provide instructions. Up to two children under 6 years are charged EUR 55 per night when using existing beds. All further older children or adults are charged EUR 55 per night for extra beds.